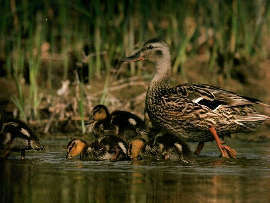 Several species of bird may be found on the river, including the mallard, the most common duck. It is a ‘dabbling’ duck, feeding on the surface of the water, eating plants and small animals. The grey heron and the kingfisher are both predators. The heron stands motionless in shallow water and strikes at a passing fish or another small creature with its dagger-like bill. The brightly-coloured kingfisher dives from a perch to catch a small fish underwater. It nests in a sandy bank, excavating a long tunnel. Find out what other birds may live along a river like this one.